Add the legendary Waldorf Wave synthesizer to your Reason Rack. Layers Wave Edition brings you the sound of the mighty Waldorf Wave in a modern, easy to use and abuse package. Four layers of unique samples from the Waldorf Wave combined with effects, built-in phrase sequencing and comprehensive modulation adds up to a powerful performance instrument, ready to evoke the futuristic sounds from a bygone era. Layers Wave Edition comes packed with hundreds of inspiration-inducing presets crafted by leading sound designers. But the straightforward user interface and top-notch sampleset also invites you to experiment on your own and create sounds from scratch that sounds just the way you want them to. Synthetic, evolving, dreamy, soft or rock hard–Layers Wave Edition has you covered. Think of each of the four layer as a separate sample player, with separate multi mode filter, envelope, effect settings, pan and level. Select one of Layers’ built in sample set for this layer. Set the envelope curve for the active layer’s filter envelope. 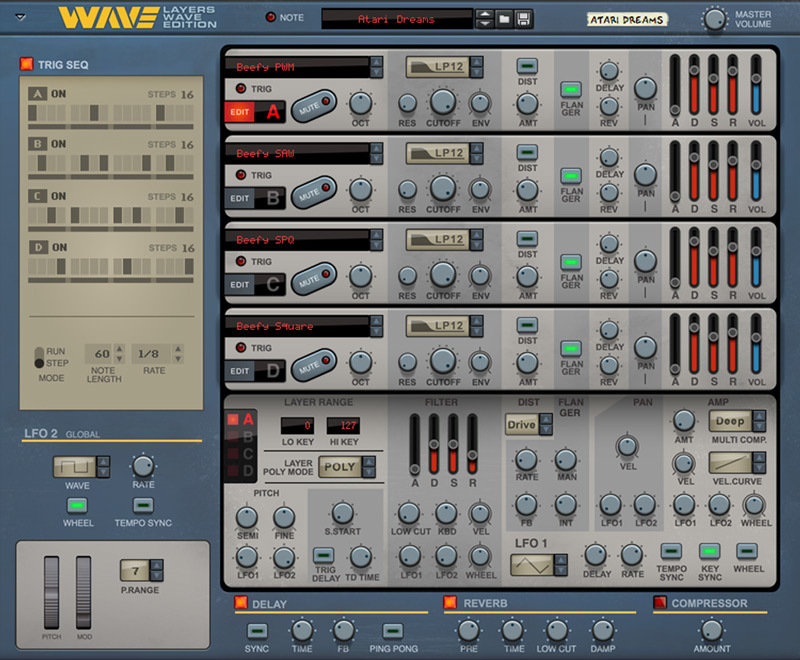 The Waldorf Wave premiered in the early 90s as the most advanced wavetable synthesizer to date. Despite its deep synthesis features, it was remarkably easy to use with its generous offering of knobs, buttons and faders to tweak just about every parameter it had to offer. A truly digital instrument, it still featured a set of analog filters that gave it a warmer sound than what is normally associated with Wavetable instruments. And people loved it. It was found in many well-funded studios of the era since the initial price was close to $10 000. The list of users include a roster of the 90s big electronic producerts: Depeche Mode, Björk, Leftfield, The Orb, Hans Zimmer and many more.